Download "The law, language and calculations. 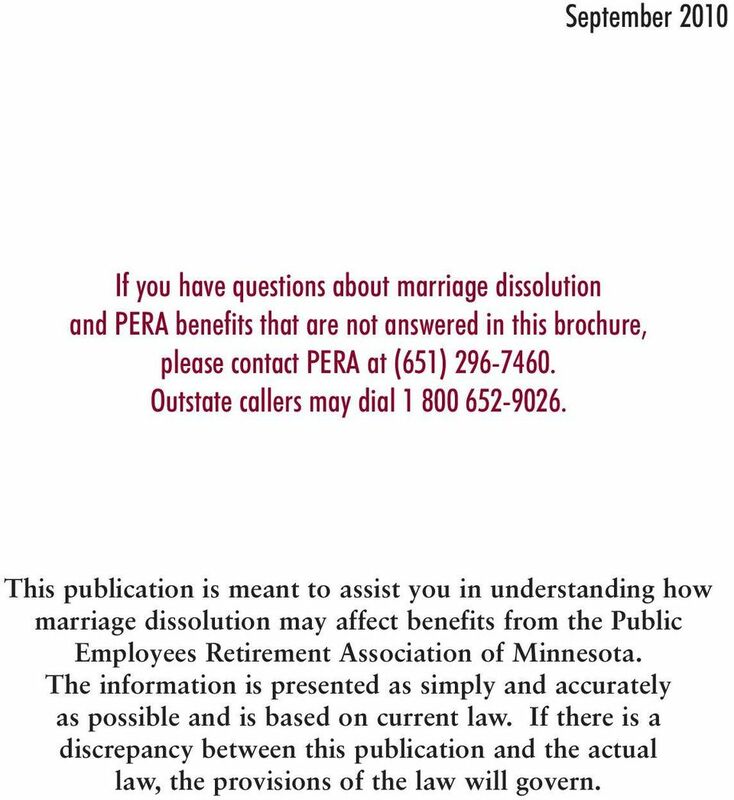 PERA Benefits and Marriage Dissolution"
2 September 2010 If you have questions about marriage dissolution and PERA benefits that are not answered in this brochure, please contact PERA at (651) Outstate callers may dial This publication is meant to assist you in understanding how marriage dissolution may affect benefits from the Public Employees Retirement Association of Minnesota. The information is presented as simply and accurately as possible and is based on current law. If there is a discrepancy between this publication and the actual law, the provisions of the law will govern. 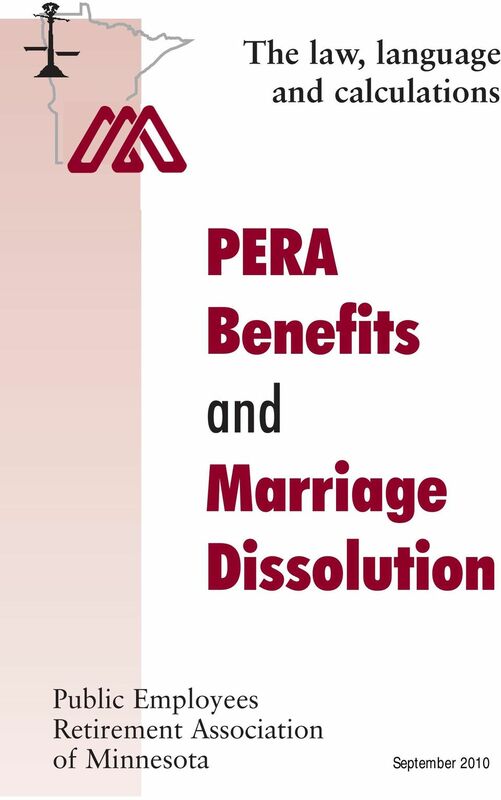 4 Introduction This booklet is designed to assist the parties involved in a marriage dissolution and their attorneys in the division of Public Employees Retirement Association (PERA) pension benefits as part of the overall disposition of marital property. A section containing guidelines for language to be used in a court order can be found on page 11. 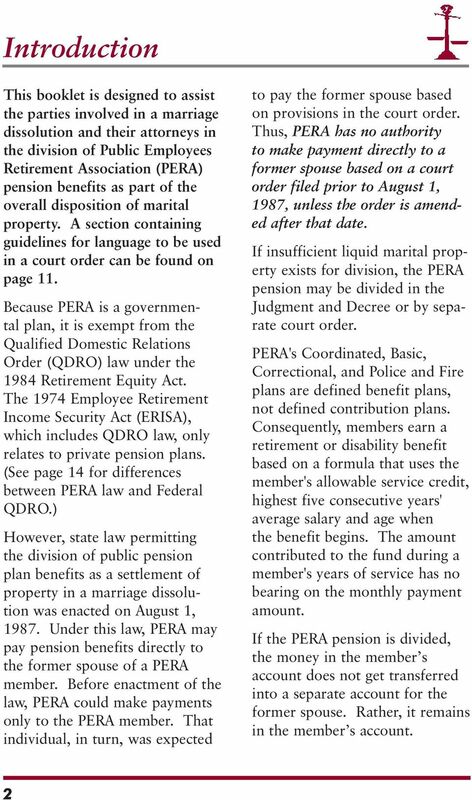 Because PERA is a governmental plan, it is exempt from the Qualified Domestic Relations Order (QDRO) law under the 1984 Retirement Equity Act. The 1974 Employee Retirement Income Security Act (ERISA), which includes QDRO law, only relates to private pension plans. 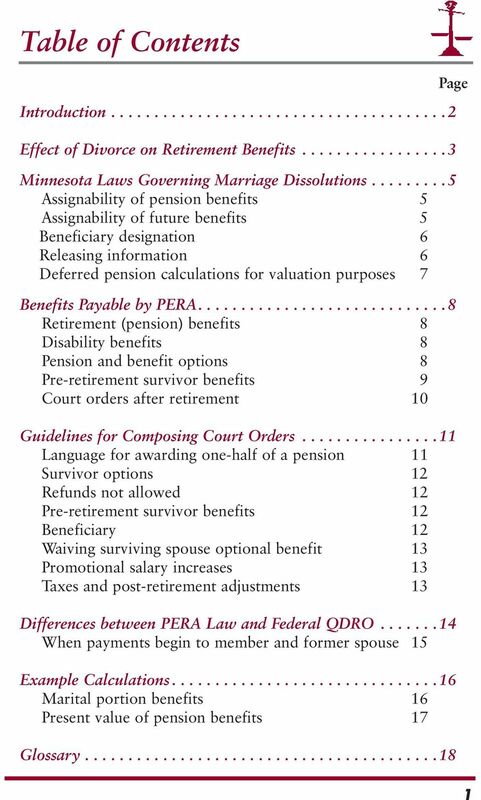 (See page 14 for differences between PERA law and Federal QDRO.) 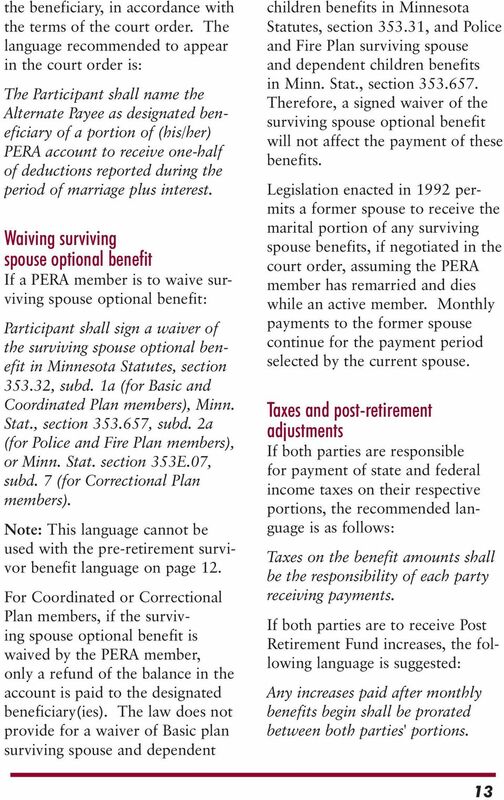 However, state law permitting the division of public pension plan benefits as a settlement of property in a marriage dissolution was enacted on August 1, Under this law, PERA may pay pension benefits directly to the former spouse of a PERA member. Before enactment of the law, PERA could make payments only to the PERA member. That individual, in turn, was expected to pay the former spouse based on provisions in the court order. Thus, PERA has no authority to make payment directly to a former spouse based on a court order filed prior to August 1, 1987, unless the order is amended after that date. 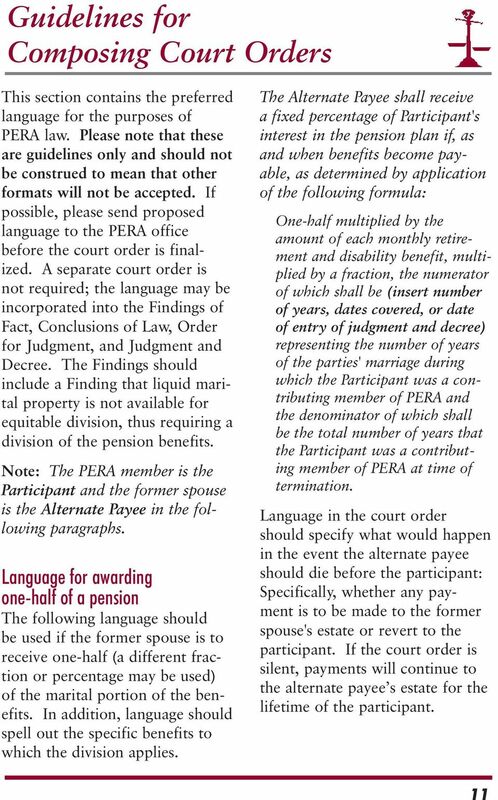 If insufficient liquid marital property exists for division, the PERA pension may be divided in the Judgment and Decree or by separate court order. 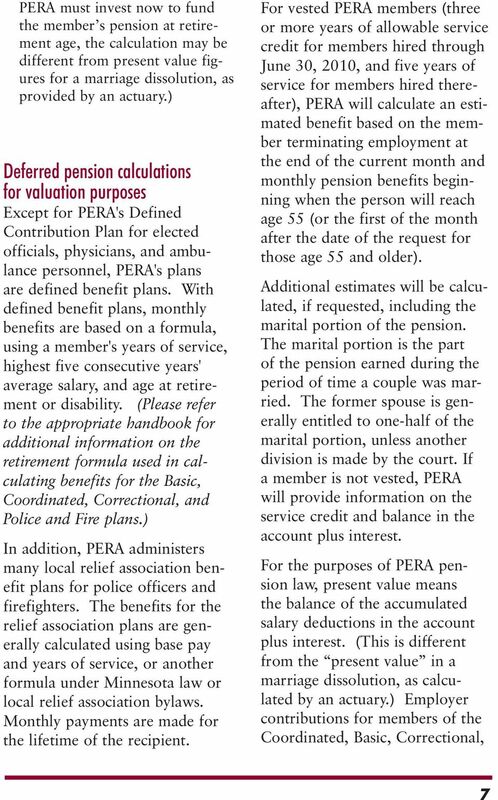 PERA's Coordinated, Basic, Correctional, and Police and Fire plans are defined benefit plans, not defined contribution plans. Consequently, members earn a retirement or disability benefit based on a formula that uses the member's allowable service credit, highest five consecutive years' average salary and age when the benefit begins. The amount contributed to the fund during a member's years of service has no bearing on the monthly payment amount. If the PERA pension is divided, the money in the member s account does not get transferred into a separate account for the former spouse. Rather, it remains in the member s account. 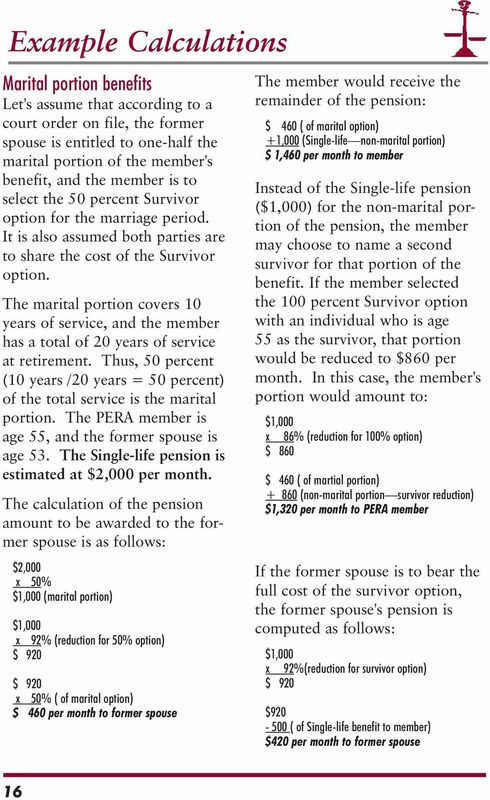 5 Effect of Divorce on Retirement Benefits Q: Do all of my PERA benefits belong to me after divorce? 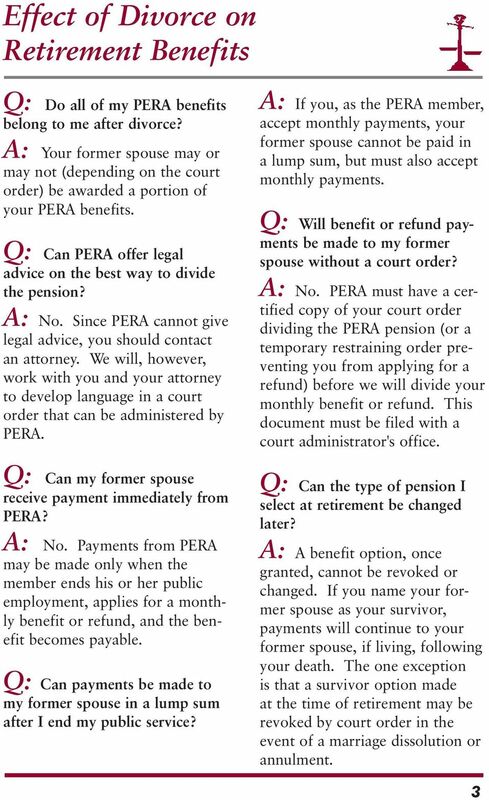 A: Your former spouse may or may not (depending on the court order) be awarded a portion of your PERA benefits. 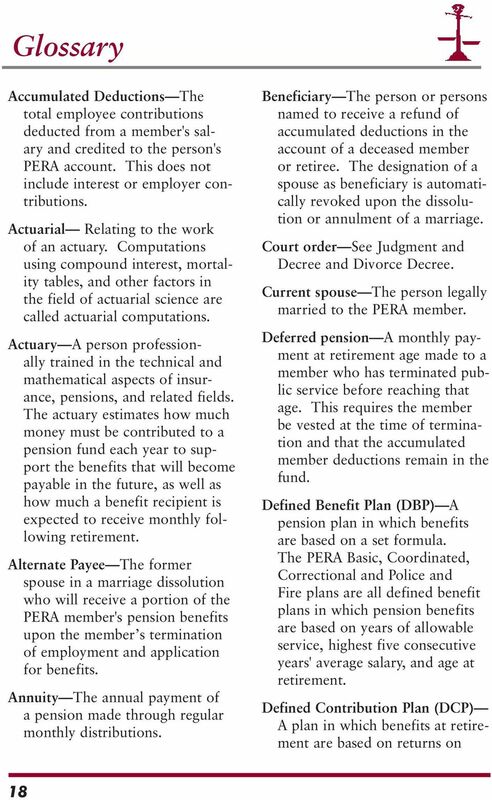 Q: Can PERA offer legal advice on the best way to divide the pension? A: No. Since PERA cannot give legal advice, you should contact an attorney. We will, however, work with you and your attorney to develop language in a court order that can be administered by PERA. Q: Can my former spouse receive payment immediately from PERA? A: No. 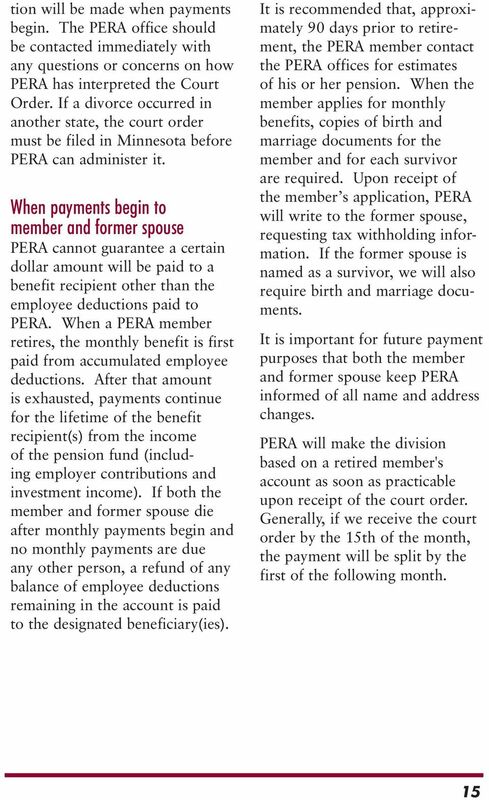 Payments from PERA may be made only when the member ends his or her public employment, applies for a monthly benefit or refund, and the benefit becomes payable. Q: Can payments be made to my former spouse in a lump sum after I end my public service? A: If you, as the PERA member, accept monthly payments, your former spouse cannot be paid in a lump sum, but must also accept monthly payments. Q: Will benefit or refund payments be made to my former spouse without a court order? A: No. 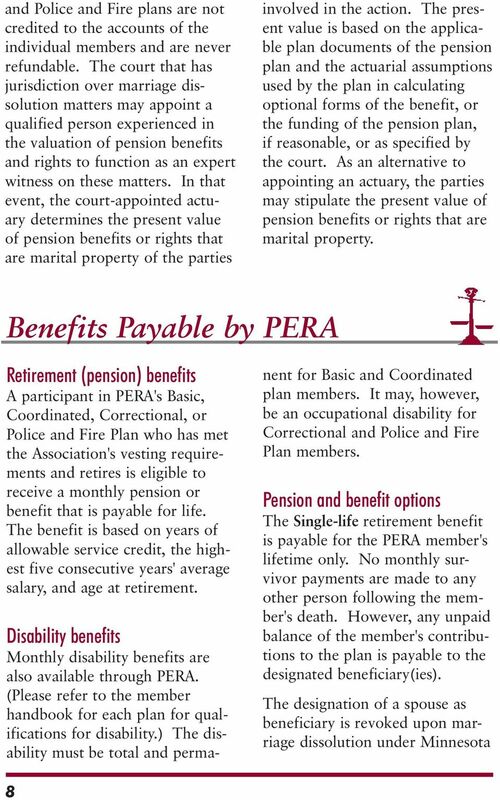 PERA must have a certified copy of your court order dividing the PERA pension (or a temporary restraining order preventing you from applying for a refund) before we will divide your monthly benefit or refund. This document must be filed with a court administrator's office. Q: Can the type of pension I select at retirement be changed later? 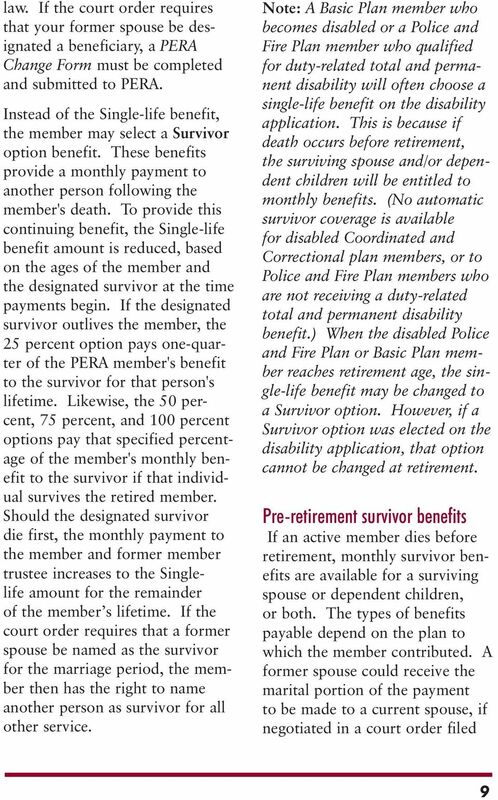 A: A benefit option, once granted, cannot be revoked or changed. If you name your former spouse as your survivor, payments will continue to your former spouse, if living, following your death. The one exception is that a survivor option made at the time of retirement may be revoked by court order in the event of a marriage dissolution or annulment. 6 Q: Do payments continue to my former spouse's estate after his/her death? A: A portion of your pension benefits or rights may be granted to your former spouse as a division of marital property, in place of liquid assets (unless the decree makes other provisions). This division is permanent. Thus, upon your former spouse's death, payment continues to your former spouse's estate until your death. 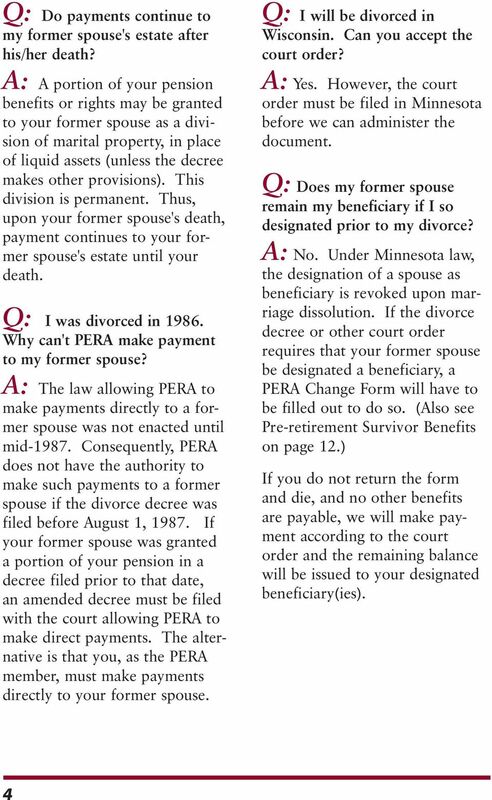 Q: I was divorced in Why can't PERA make payment to my former spouse? 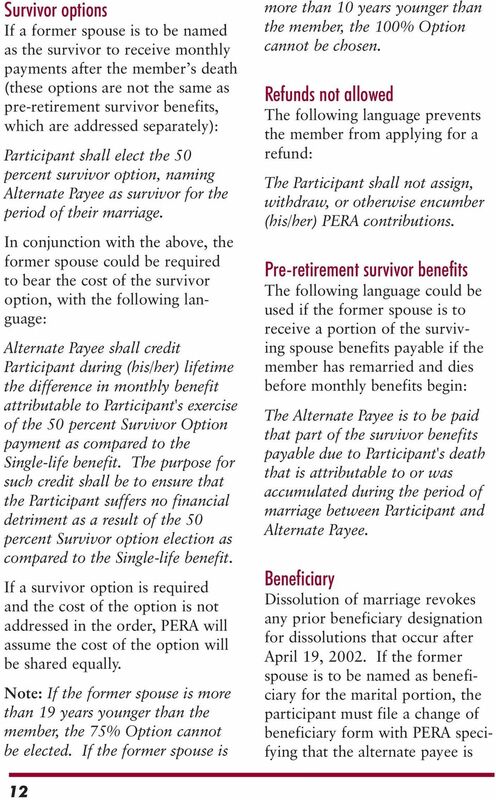 A: The law allowing PERA to make payments directly to a former spouse was not enacted until mid Consequently, PERA does not have the authority to make such payments to a former spouse if the divorce decree was filed before August 1, If your former spouse was granted a portion of your pension in a decree filed prior to that date, an amended decree must be filed with the court allowing PERA to make direct payments. 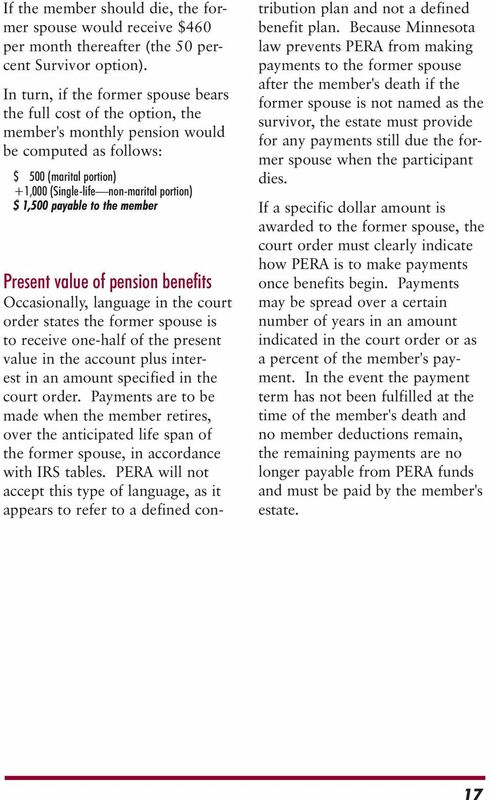 The alternative is that you, as the PERA member, must make payments directly to your former spouse. Q: I will be divorced in Wisconsin. Can you accept the court order? A: Yes. However, the court order must be filed in Minnesota before we can administer the document. Q: Does my former spouse remain my beneficiary if I so designated prior to my divorce? A: No. Under Minnesota law, the designation of a spouse as beneficiary is revoked upon marriage dissolution. If the divorce decree or other court order requires that your former spouse be designated a beneficiary, a PERA Change Form will have to be filled out to do so. 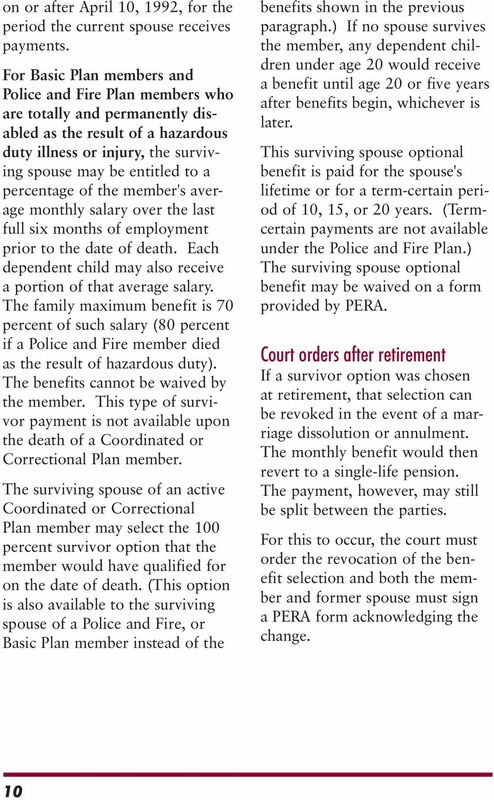 (Also see Pre-retirement Survivor Benefits on page 12.) If you do not return the form and die, and no other benefits are payable, we will make payment according to the court order and the remaining balance will be issued to your designated beneficiary(ies). 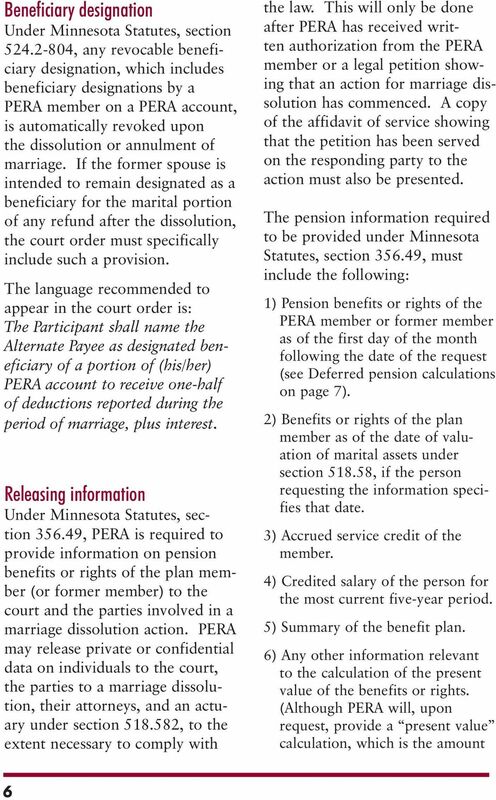 7 Minnesota Laws Governing Marriage Dissolutions Assignability of pension benefits Minnesota Statutes, section , states that annuities and benefits payable from PERA are not assignable or subject to execution, levy, attachment, garnishment, or legal process, except as provided in sections , or 518A.53. Section , subdivision 3, states in part: If liquid or readily liquidated marital property other than property representing vested pension benefits or rights is available, the court, so far as possible, shall divide the property representing vested pension benefits or rights by the disposition of an equivalent amount of the liquid or readily liquidated property. 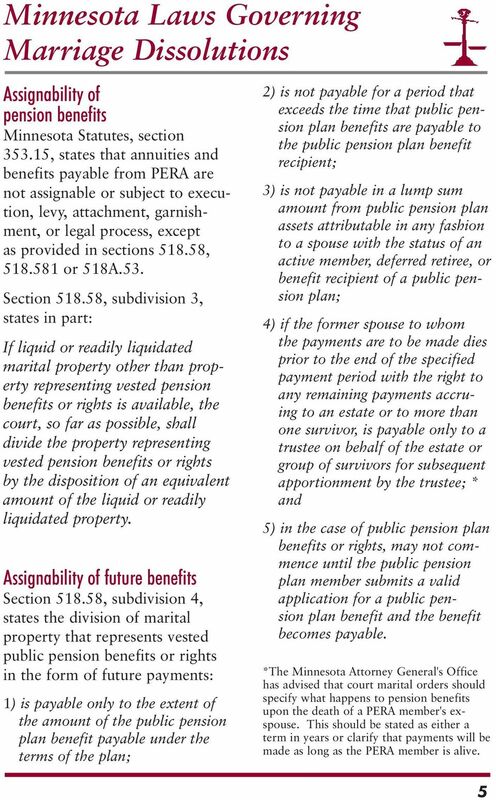 Assignability of future benefits Section , subdivision 4, states the division of marital property that represents vested public pension benefits or rights in the form of future payments: 1) is payable only to the extent of the amount of the public pension plan benefit payable under the terms of the plan; 2) is not payable for a period that exceeds the time that public pension plan benefits are payable to the public pension plan benefit recipient; 3) is not payable in a lump sum amount from public pension plan assets attributable in any fashion to a spouse with the status of an active member, deferred retiree, or benefit recipient of a public pension plan; 4) if the former spouse to whom the payments are to be made dies prior to the end of the specified payment period with the right to any remaining payments accruing to an estate or to more than one survivor, is payable only to a trustee on behalf of the estate or group of survivors for subsequent apportionment by the trustee; * and 5) in the case of public pension plan benefits or rights, may not commence until the public pension plan member submits a valid application for a public pension plan benefit and the benefit becomes payable. 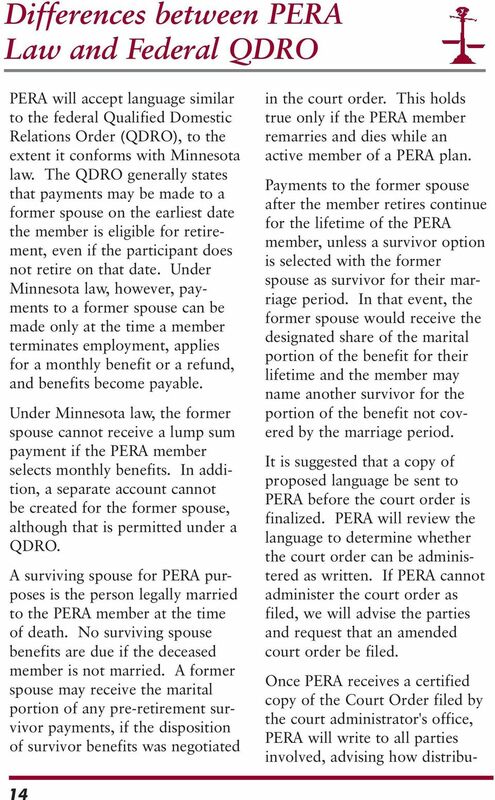 *The Minnesota Attorney General's Office has advised that court marital orders should specify what happens to pension benefits upon the death of a PERA member's exspouse. This should be stated as either a term in years or clarify that payments will be made as long as the PERA member is alive. Disability Coverage. This brochure can also be made available in alternative formats, such as large print, Braille, or on tape. Rev. annuity options. Master Retirement Plan Your Master Retirement Plan Handbook... Key points in understanding this generous benefit: Remember, if you re married, you can select any of the payment options. For IPERS Beneficiaries Important Information About IPERS Death Benefits For IPERS Beneficiaries Important Information About IPERS Death Benefits IPERS provides financial protection to members beneficiaries. Woodmen will fund the Plan for you and all other eligible Employees subject to the termination provision.